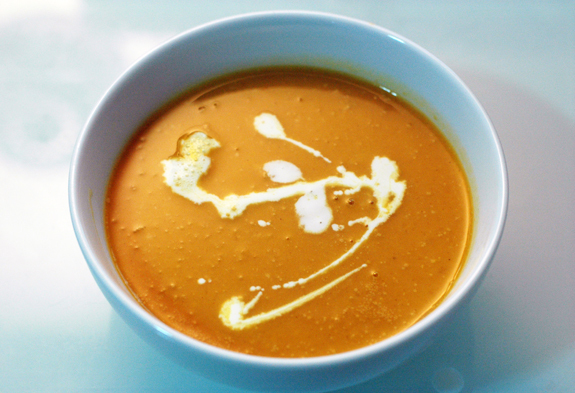 There are few classic fall dishes I love more than butternut squash soup. It’s a great combination of creamy, earthy sweetness. I’m not generally a fan of most soups, but I’ll happily scarf down a bowl of this. With the abundance of reasonably-priced squash in the grocery stores, I thought it a shame not to try it. Preheat the oven to 350 F. With a vegetable peeler, remove the skin from squash. Cut the squash in half lengthwise and scoop out the seeds. Place the squash on a baking sheet and drizzle with olive oil. Roast squash until soft and caramelized, about 30 minutes. To make the soup, melt butter in a large pot over medium heat. Add shallots, garlic, spice purse, salt and pepper. Cook until shallots are soft and translucent. Add wine and cook until mixture is reduced by half. Add squash, sugar, stock and cream. Cook until the flavors blend together, about 30 minutes. Remove the spice purse and season with cinnamon, nutmeg and licorice root. Puree the soup in a blender (working in batches). Strain through a fine strainer and serve. A few notes on preparation: We omitted the licorice root (since we didn’t have any). We also substituted onions for shallots. We decided to puree the soup first before adding in the cinnamon and nutmeg. David also added an additional tablespoon of ground white pepper, for an extra kick. After pureeing, we simmered it for another 10-15 minutes to thicken it up a bit more. We also didn’t bother straining it, as it was smooth enough for our taste. It turned out to be a lovely dish–round and earthy, creamy, though not super creamy. The original recipe included a spiced creme fraiche accompaniment, so we made creme fraiche (though it wasn’t ready in time for the initial tasting). The soup tasted even better the next day for lunch, as the flavours had a chance to develop further. The batch was large enough that we’ll likely freeze a portion. All in all, a delicious soup to warm us up on these cool fall nights!